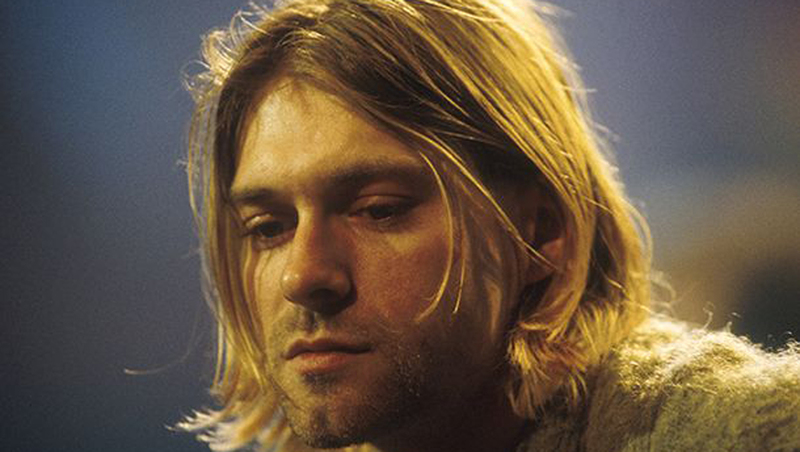 The Seattle Police Department is releasing more previously-unseen clues regarding the mysterious death of Nirvana frontman Kurt Cobain. On Monday, police are revealing a report detailing a cold case homicide detective's recent review of the 20-year-old investigation. As the 20-year anniversary of Cobain's apparent suicide in early April approached, the SPD announced a cold case detective was reviewing the file and began releasing new information including never-before-seen photos from the scene. The musical phenom was found dead in his Seattle-area home in April of 1994, and his fans have since mourned another senseless rock and roll death at the hands of drugs. The King County Medical Examiner ruled his death a suicide, saying Cobain shot himself with a 20 gauge shotgun after taking what would have otherwise been a lethal dose of heroin. A certain sector of fans and observers -- most notably Tom Grant, the private investigator and former cop hired by Cobain's wife, singer and actress Courtney Love, to find Cobain when he went missing during the days before his death -- have insisted that Cobain's death was not suicide, but rather a murder conspiracy. The new report confirms statements made recently by the SPD detective who conducted the review, that "the investigation on the death of Kurt Cobain, which was conducted 20 years ago, reached the correct conclusion that the manner of death was (Suicide)." Detective Mike Ciesynski, a veteran with 20 years working homicide and ten years specializing in cold case investigations, explains in the report that he learned of a new clue about the shotgun shell that killed Cobain. As part of his review of the evidence, inside the bag of shotgun shells SPD found at Cobain's side 20-years ago, Det. Ciesynski writes, "I recovered a sales receipt for $6.95, which was dated 4-2-94. On the box of 20 gauge ammunition is a price sticker for $6.95 from 'Seattle Guns.'" This sales receipt had not been previously disclosed by the SPD. For the first time, Det. Ciesynski claims to have connected this date of April 2, 1994 on the receipt, first to the store Seattle Guns, and then to what he identifies as another significant piece of information from the original detectives' follow-up report. In that report "it was noted that a Gray Top Taxi picked up a male from the Cobain residence on the morning of 4-2-94. This male advised the cab driver that he wanted to find a place to buy some bullets since he had recently been burglarized. The cab driver dropped this person off in the area of 145th and Aurora." Ciesynski's new report explains that Seattle Guns was located just south of 145th and Aurora. Conspiracy theorists like Grant insist that a conspirator fired the weapon that killed Cobain, questioning his ability to do so after taking such a large dose of heroin, and questioning Cobain's will to commit suicide. Det. Ciesynski's determination that Cobain purchased the shotgun shells within one or two days of his death appears to suggest a person planning a suicide, more than it might the coincidence of Cobain buying the shells that a conspirator ultimately used to kill him in a planned, staged suicide. The SPD always believed it was Cobain who took the taxi cab on April 2, 1994, and that he killed himself with the shotgun either later that day or the following day, unable to pinpoint a time of death because the body was discovered days later. For the first time only weeks ago, SPD released a photo of those shotgun shells inside a paper bag next to Cobain's foot and his purple Converse All Star sneaker. According to the report the receipt for $6.95 dated April 2, 1994, was also inside that paper bag. A close look at the photo reveals the sticker mentioned in the report on top of the box of shotgun shells on which is printed "Seattle Guns" and the price of the shells, "$6.95." Also, for the first time, Det. Ciesynski explicitly details an SPD theory of how Cobain fired the shotgun, and reveals that recently developed 35 mm SPD film taken at the scene of the death helped him to make this determination. Last month Crimesider first published 30 of these never-before-seen photos which had sat for 20 years in the SPD evidence room undeveloped. "As a homicide detective I have an obligation to preserve evidence that I believe may lose its value due to decay," Ciesynski explains in the report justifying his decision to develop the film now. Ciesynski notes that his review of the newly developed 35 mm film indicated that "a spent yellow shell casing lying on a coat at the right side of the photo " (beyond Cobain's left arm, or to the left side of his prostrate body). "I was aware that for the casing to have landed to the victims (sic) left, the weapon would have had to been turned 180 degrees from what it was found." The detective explains that he consulted with an SPD Range Armorer, an expert in maintaining and operating firearms, showing him "a photo of victim (Cobain) holding the weapon" but did not identify the victim to the expert. The Armorer concluded that the "fired round would have ejected in the direction where it was found and the second round probably malfunctioned due to victim holding the barrel.... The weapon probably pivoted when fired, and fell to the present position." Conspiracy theorists have long questioned why the ejected shell casing was found beyond Cobain's left arm -- a picture of the victim's left arm was also recently released for the first time by SPD -- when as the SPD report states "the Remington 20 gauge shotgun was lying on victim's chest with the receiver facing up." If the receiver was facing up, then in that position the shell would have ejected in the direction of Cobain's right arm rather than his left, leading conspiracy theorists to surmise a staged suicide scene. Det. Ciesynski's review, according to the report, included examining "the case file from SPD records vault... all of the remaining evidence from SPD Evidence," photographs of the death scene, the autopsy report, and the autopsy and toxicology report, as well as interviews with the Chief Medical Examiner, and one of the original case detectives now retired. In addition, Det. Ciesynski, who says in the report he "knew very little about (Cobain) or his band Nirvana" at the time of Cobain's death, also explains he "read numerous articles and watched several documentaries on the death of Kurt Cobain." The report also summarizes previously released information from the Medical Examiner's autopsy report, although the actual autopsy report has never been made public per Washington State law. A spokesperson for the King County Medical Examiner explained to Crimesider that Wash. law also restricts the medical examiner from commenting on autopsy reports. The fact that the autopsy report has never been released and publicly examined by independent experts is another reason that conspiracy theorists question the manner of death. It is doubtful this SPD cold case review of the investigation of Cobain's death will ultimately satisfy these conspiracy theorists, as the private investigator who once worked for Love, Grant, and his conspiracy theories are a major part of an upcoming documentary feature film "Soaked in Bleach" examining the days prior to and the investigation of Cobain's death.